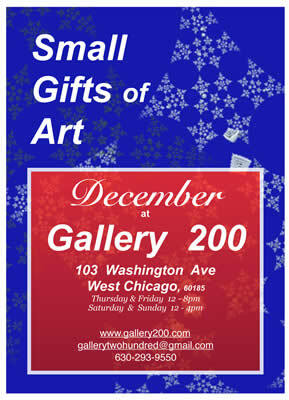 If gift cards, on-line shopping, malls, and mass production have lost their charm, then Gallery 200 is place for you. This is the year to shop local. For December, Gallery 200 brings you small and artistic pieces, gorgeous and unique, designed to please you and your wallet. if you are one of those “one for her, oh OK, one for me” shoppers, Gallery 200 is the place to shop! Join us at the opening reception – meet the artists and enjoy refreshments! First Star Art by jrr & jammer – Whimsical Art: stocking stuffers, puppets, totes, greeting cards, gift tags, more! Heide Morris – Knit wear, ankle warmers, hand warmers and headbands, ceramic pieces, beaded utensils. Sue Tripp – Fun and Functional Fused Glass Art, including small dishes, jewelry, dreamcatchers, and ornaments. SMALL GIFTS OF ART is on display for the entire month of December!